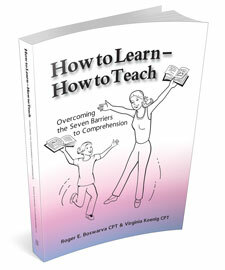 Your book “How to Learn – How to Teach” is simply exceptional. I have read it once through and found it extremely inspiring, especially the section on appreciation. The book’s superb concept, flowing literacy and illuminating examples have significant positive impact. It is definitely an eye-opener for anyone fortunate enough to study it. I will definitely read it several times more as you recommend. Marlaina Gayle, Columnist, The Province Newspaper & Contributor to CBC Newsworld/BCTV News Hour, Vancouver, Former Press Secretary and Media Liaison for the Loyal Opposition, Government of British Columbia, Canada. When I did my first exercise from How to Learn – How to Teach, I experienced the astounding effect of the Barriers to Comprehension. It created a profound awareness in me of just how damaging these barriers can be. How to Learn – How to Teach definitely contains the answers on how to learn; and also the key to personal productivity and success in life.